*This post contains affiliate links. This post also contains sponsored content for activities in the Pigeon Forge/Gatlinburg area. All content and opinions are my own. When planning a vacation for our family, my husband and I always look for a place that is family-oriented, has fun for everyone, and allows for adventure. We’ve been to Tennessee a few times over the past 10 years and we always enjoy ourselves. Every year we go back there is always something new to do or something that we wanted to try last time but we just had too many activities planned! I put this Tennessee Vacation Guide for Families together to share our favorite areas and activities. Pigeon Forge and Gatlinburg are top tourist areas in the Smokies. There are countless hotels, resorts, and cabins to choose from for your stay. It really depends on preference but one of our top priorities is to search for something that has enough space for our family. That way when we have a relaxing day we can all have personal space. Our family always enjoy staying in a cabin when visiting the Smokies because they’re all unique and a lot of the cabins have game rooms! One of my favorite places to check cabins out at is at CabinsUSA. There are benefits of staying in a resort or hotel. Free breakfast, parking, and included activities can definitely make staying in a hotel more appealing for some families. Wherever you choose to stay in Pigeon Forge or Gatlinburg, rest assured there will be plenty of fun things to do for your family! There are so many things to do in the Smokies. When you have children that and have a large gap in ages it can be hard finding something appealing to them all. A fun family experience is your goal when planning activities and I have a great one to share for you to try! The Escape Game Pigeon Forge is located on the Island and it is awesome! We have children ranging from 3 to 13 years of age and everyone can play a role in this activity. My three year old was able to figure something out within the game that my husband and I couldn’t – it is seriously fun! If you’ve never played an escape game before here’s the rundown: You have one hour to answer riddles, unlock combinations, find keys to lock boxes, etc. There’s a storyline to all the games you play and it’s very interactive. We played The Heist last year and we all really enjoyed it. This year we headed back there for more fun and played Gold Rush and their newest game, Mission: Mars. There is no better sense of accomplishment for me than seeing my family all work together for a common goal and having lots of fun doing it! The Island has free parking and trams come and pick you up and take you to all the fun. One of the first things you’ll see is the beautiful dancing water fountain. Every half hour the water fountains dance to the playing music and it is so fun to watch! There are lots of activities, places to shop, and fun food to give a try on the Island. You can easily spend a whole day checking out the arcade, unique shops, grabbing a bite to eat, and riding the 200 foot tall Great Smoky Mountain Wheel. Wonderworks Pigeon Forge is something that our kids always enjoy doing. It’s not on the Island but it’s nearby on the Parkway and you can get hours of fun out of it for your family. Wonderworks like to change things up so there’s always something new to check out. Between the rock climbing wall, indoor ropes course, or just running around on a giant piano… this is a great place for adults and children alike. They even have a magic show that you can add onto your ticket – it’s a lot of fun! Something new we tried this year was Ripley’s Old MacDonald’s Farm Mini Golf. It is enjoyable for both adults and children. The silliness of the farm animals will for sure get giggles from the little ones. There are 3 courses to choose from and they’re all entertaining, interactive, and there lots of chances to get a hole-in-one for children. Ripley’s Mini Golf is conveniently located next to Tanger Outlets for easy parking. Our favorite place to eat in Sevierville is Steak-n-Shake. It is reasonably priced, has tons of children’s menu options and has quick service. During the week they have Happy Hour between 2 and 4 PM and their shakes are half off. It’s a place that we always head to again and again because the children really enjoy eating there. Also, it’s a great place to grab a sweet treat for the family and not spend a lot of money. I’ve been to other Steak-n-Shake’s and this one is by far the best. It’s the traditional sit-down style with a full menu and the service is fast. As a side note, my son has a peanut and tree nut allergy and they took a lot of care into making sure they didn’t cross contaminate his milkshake at the milkshake station. Another place our kids loved was Chocolate Monkey. Beware for those with nut allergies – they warn of cross contamination for all of their products except their ice cream. The store has a wonderful scent of fresh chocolate and their display cases are mouth watering. My 3-year old talked about the Chocolate Monkey throughout the vacation and for weeks after the trip. If you’re looking to attend a dinner and a show – Dolly Parton’s Smoky Mountain Adventures Show is a must try! It has a lot of different acts and the grand finale is really awesome! The servers are all very friendly and they can substitute your food to fit your needs. As mentioned above our son has an allergy and they made sure his food didn’t come in contact with any of the foods he is allergic to. The Smoky Mountain Adventures Show is a great place for entertainment as you can get your belly full of a country-style dinner, relax and enjoy a variety of acts. The Smoky Mountain Adventures Show is conveniently located near the Island at Pigeon Forge. Gatlinburg is lined with unique and fun shops. 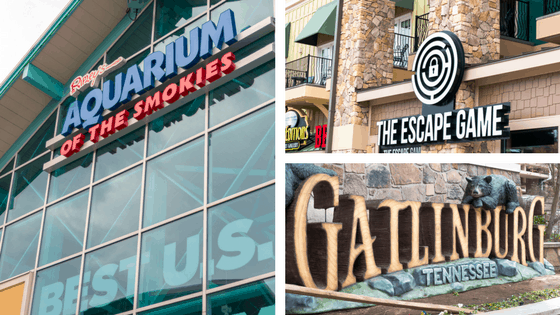 There are tons of places to visit within Gatlinburg – our favorite being the Ripley’s Aquarium of the Smokies. We have been a few times and this time around they had made some changes within the aquarium. There is a play area for the children that was a lot of fun and the exhibits were great to view as always. All of the exhibits were labeled with information and attendants frequented the exhibit areas to answer questions. It’s a great place to spark curiosity in children about marine life and the whole aquarium should take about 1 1/2 hours to go through… but we spent closer to three hours because we were having such a blast. You won’t be disappointed by this aquarium! This aquarium is very well maintained – The fish are well taken care of and the tanks are very clean. While walking through Gatlinburg there a lot of attraction spots to stop at. The Ripley’s Mirror Maze was a lot of fun, especially for our youngest. The maze didn’t take very long to go through but to maximize your experience you should definitely spend the few extra dollars to purchase the 3D glasses before going in. It raises the difficulty level of the experience. The Ripley’s Moving Theater 5D in Gatlinburg was fun for my 7 year old. After entering the line we found out my 3 year old son had to sit in a non-moving seat with an adult during the 15 minute movie. He was disappointed at first but still got a lot of enjoyment out of the experience. There is an intermission period that allows adults to switch spaces so both can get the 5D experience. The Guinness World Records Museum by Ripley’s was a lot more fun than we anticipated. The museum is interactive and even has official record breaking attempts for certain activities. Parts of the museum are like an arcade that you can play as much as you want at no additional cost. There’s something for all ages and you can easily spend a few hours there. My kids didn’t want to leave the museum when we were through and wanted to go back and do more. You can purchase combo tickets for the Ripley’s attractions by going to their website and picking your attraction combo choices. It definitely saves you money and you can get more bang for your buck! Every year that we go to Tennessee, one of top things I personally look forward to doing is eating at the Pancake Pantry. They have fresh and delicious food and amazingly tasty homemade butter. They’re not a food chain that you can find anywhere and they only have two locations: one in Nashville and one in Gatlinburg. There’s one catch however, they only take cash. They do have an ATM within their establishment, so be prepared to withdrawal cash or have it handy. There was a line for service when we arrived on Spring Break but it didn’t last long. The service is fast moving and the kitchen is quick to keep up with orders. We were the 15th party in line and was seated within 10-15 minutes. Ordering took a small amount of time and the food came out hot, delicious, and quick. One thing we always fit in while visiting the Smokies is going on an adventure. It’s always fun to go out hiking, checking out the beautiful scenery and getting much needed exercise and fresh air. Visiting Clingman’s Dome is a wonderful spot to visit and the scenery is just as beautiful on the drive there. It’s about an hour and a half away from Gatlinburg so it’s a bit of a drive but definitely worth it! We love Tennessee and our whole family keeps wanting to back year after year. I hope you have enjoyed me sharing our family vacation and I hope that it has inspired you to check out the Smokies for yourself… It really is a lot of fun! Get tips and tricks on planning a family vacation here! I absolutely LOVE Pigeon Forge and Gatlinburg. My favorite things to do are completing a hike to the waterfalls and eating at Paula Dean’s restaurant. It’s a yearly tradition. We didn’t eat Paula’s restaurant but it’s definitely on my list for next time! We also love hiking to the waterfalls.